Classic Film and TV Café: Let's Go to Witch Mountain! Ike Eisenmann and Kim Richards. Newcomers Tony and his sister Tia don't blend in with the other children at the Pine Woods orphanage. That will happen when you have telepathic, telekinetic, and clairvoyant powers. The two siblings try to hide their extrasensory abilities, although Tony obviously has trouble doing so. When he and Tia save the mysterious Mr. Deranian from a car accident, the man appears at the orphanage claiming the children are his long-lost niece and nephew. Tony and Tia can't dispute Deranian's story, because they can't remember their early childhood (although Tia has occasional visions of almost drowning). After providing forged legal documents, Deranian adopts the siblings and moves them into the mansion of his employer, Aristotle Bolt. It quickly becomes evident that Bolt intends to use the children's powers for his own benefit. Meanwhile, Tia discovers a map that may provide the answer to her and Tony's origins. 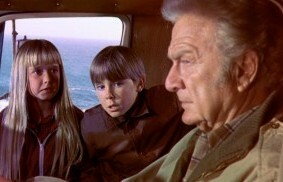 The paranormal kids and normal Eddie Albert. Escape to Witch Mountain (1975) is one of the best Disney live action films of the 1970s, For the most part, the decade was not kind to the family-friendly film company. It struggled with big-budgeted flops like Bedknobs and Broomsticks (1971) as well as more reasonably priced pictures (e.g., 1973's One Little Indian) that failed to find an audience. Heck, even Fred MacMurray--once one of Disney's most bankable stars--couldn't make a hit out of Charley and the Angel (1973). Escape to Witch Mountain benefits from a well-plotted story and a good cast. The former can be attributed to Alexander H. Keys' 1968 science fiction novel. The film's screenplay simplifies Key's book and makes some substantial changes. For example, in the novel, Tia is mute and communicates with Tony only through telepathy. However, the film still retains the central mystery of the children's origin and the mysterious map leading to Witch Mountain. A persuasive cast carries the film nicely, particularly the always reliable Donald Pleasance as Deranian and Eddie Albert as a cynical widower that ends up helping Tia and Tony. Unfortunately, Ray Milland is wasted as the one-note villain. 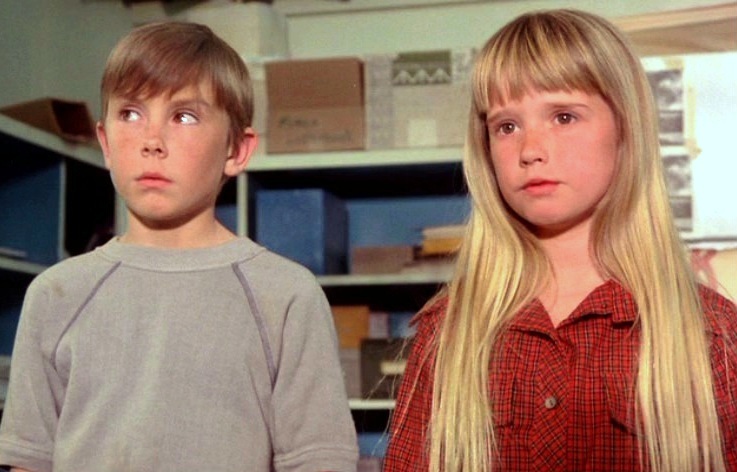 As for the kids, Kim Richards (Tia) comes across as a more natural performer than Ike Eisenmann (Tony). Richards was a busy child actor, having co-starred as Prudence in the 1970-71 TV series Nanny and the Professor. And--before you can ask--yes, she grew up to be the same Kim Richards that gained notoriety on the reality TV series The Real Housewives of Beverly Hills. Lee and Davis as the baddies. Despite a solid showing at the box office, Disney waited three years to mount the sequel Return from Witch Mountain (1978). It reunited Richards and Eisenmann as the paranormal youths, but unwisely omitted Eddie Albert. 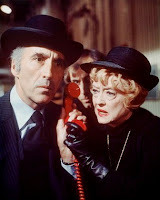 Christopher Lee and Bette Davis (in one of her worst later roles) star as the villains. There's practically no plot with the emphasis being on an increased number of cheap-looking special effects. In 1982, Disney produced a busted TV pilot called Beyond Witch Mountain, which starred Eddie Albert and featured Efrem Zimbalist, Jr. as Bolt. In 1995, Disney remade the original as a made-for-TV film with Robert Vaughn as Bolt. This time, the kids were named Danny and Anna and were helped by a young waitress. Finally, in 2009, Dwayne "The Rock" Johnson headlined Race to Witch Mountain, playing a Las Vegas cabbie that befriends two unusual siblings named Sara and Seth. Kim Richards and Ike Eisenmann had cameos as, respectively, a waitress and a sheriff. A movie I haven't seen in a long time, but retain fond memories. I enjoyed reading about it and its lamentable sequels, and about little Kim Richards and her current travails. I remember Ike Eisenmann from The Fantastic Journey, a TV show that I really enjoyed. Second pic reminds me of Eddie Albert's line, "You two kids have powers beyond belief!" I haven't seen this one Rick - and I have to admit I pretty much quit watching Disney live action movies after Love Bug until the late 80s. I may watch some of them now, but as Isaac Bashevis Singer used to say, "I wouldn't go to Flushing" to see them. In the 1978 tv series Space Academy there are a brother and sister pair who also have telepathic and telekinetic powers and I can't help but think of Tia and Tony whenever I see them. As for how they ended up in space isn't too far a stretch, since the Escape to Witch Mountain story already established them as being from another planet!